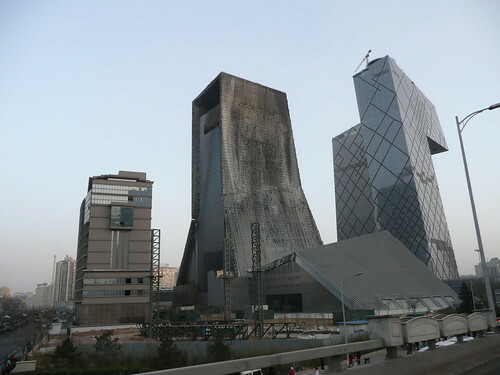 As images of a surprisingly intact TVCC building emerge after yesterday’s inferno, the China Central Television network (CCTV) was forced to admit that a fireworks display put on by its employees caused the fire to its iconic new headquarters complex in Beijing, designed by OMA’s Rem Koolhaas and Ole Scheeren. Beijing Fire Control Bureau has confirmed that a senior official of the office of the CCTV new headquarters construction project hired people, without any reference to superiors, to illegally set off fireworks, which caused the fire, according to the statement. CCTV hired staff from a fireworks company to ignite several hundred large festive firecrackers in an open space outside one of its nearly-completed buildings, said Luo Yuan, spokesman and deputy chief of Beijing Fire Control Bureau. Four camcorders recorded the fireworks display and the entire ignition process. The people who ignited the fireworks are being questioned by police and remains of fireworks have been seized. Beijing residents who wanted to see the smoking shell of the hotel had a harder time on Tuesday finding images of the fire on the Internet, on television or in the city’s newspapers. There were no pictures on the front page of The Beijing News. On Tuesday morning, the home page of Xinhua featured a photo from another event: a stampede in South Korea that left four people dead. Throughout the day, CCTV’s brief bulletins about the blaze omitted images of the burning tower. By evening, the newscast skipped the story entirely. Even before the flames had been put out early Tuesday, pictures of the burning hotel had been removed from most of the main Internet portals serving China. In the afternoon, the story had been largely buried, although by the evening, news of the fire was accessible on the Xinhua and CCTV Web sites. The critical take has been much the same–arguably echoing points we made in UPDATE 4 in our original post–with Paul Goldberger and Jonathan Glancey seeing symbolism buried amidst the flames.